As part of our surprise trip to Puerto Rico, we spent a day in Old San Juan Puerto Rico. Old San Juan Puerto Rico is on the UNESCO World Heritage Site list, so since I like to update my travel maps, it seemed like a natural fit! In addition to the mangy malnourished animals and rundown buildings (I lived in the Dominican Republic for 2 years, so neither of those really faze me), as we were crossing up to Avenida Rivera, a guy came up to us and asked if we spoke English. His English was native, and he proceeded to tell us a story about he was on a cruise ship and he was walking with his dad and they got lost, and then mugged, and the police had taken his dad to the hospital but he needed like 4 bucks to pay this guy for taxi fare (or something). Perhaps I’m just overly jaded, but it sounded a bit fishy, so we moved on and he didn’t pursue us. We got off the white Old San Juan trolley at Stop 16, at the corner of Recinto Sur and Fortaleza. On the recommendation of the front desk at the Hyatt House San Juan, we were headed to the Casa Cortes Choco Bar, a restaurant that serves every dish with some sort of chocolate. This was Carolyn’s kind of place for sure!!! 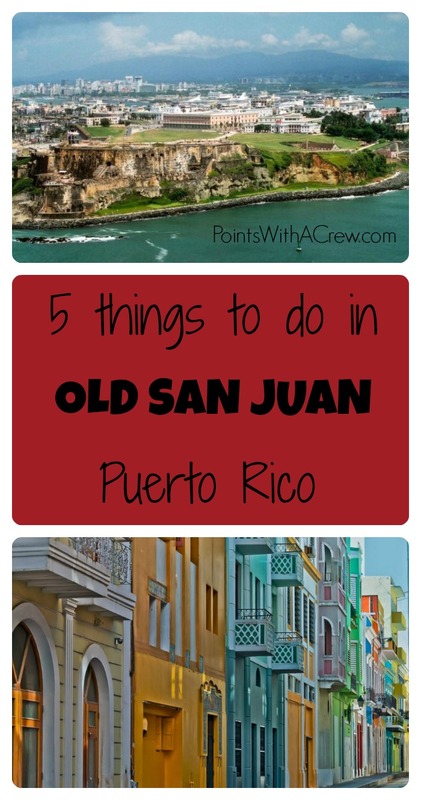 Ever been to Old San Juan Puerto Rico? Is there something else you’d recommend that we missed? I’ve heard that line before in Condado… he told me he was from WI, said his dad was mugged in the hospital and was not very kind. Many reports about this guy on Cruise Critic… he seems to get mugged every time there is a cruise ship in town. Wow I just read up on some of those posts – I’m glad we didn’t fall for it then! Nothing to comment on PR. Just wanted to say I appreciate the browns hat and factory of sadness shirt! The same creepy guy told my husband and I that story. He needed $8 for a taxi to get to the hospital where his dad was. It’s crazy how long he’s been around! Same creepy guy hit us up tonight, too. Story seemed very off to me. There was also a cruise ship in town. If I were him or his dad, I would check a cruise schedule and avoid being “robbed” again. Creep.